In 1960, Eugene Shoemaker and a team of other scientists founded the field of astrogeology to develop tools, methods, and training for the Apollo astronauts exploring the Moon. In 1962, the U.S. Geological Survey (USGS) Branch of Astrogeology was established in Menlo Park, California; and in 1963, the Branch moved to Flagstaff, Arizona, to be closer to the young lava flows of the San Francisco Volcanic Field and Meteor Crater, in Northern Arizona. These geologic features were considered good analogs for the Moon and other planetary bodies, and valuable for geologic studies and astronaut field training. From its Flagstaff Science Campus, the USGS has supported the NASA space program with scientific and cartographic expertise for more than 50 years and continues to be a leader in the field of Space Science Research. 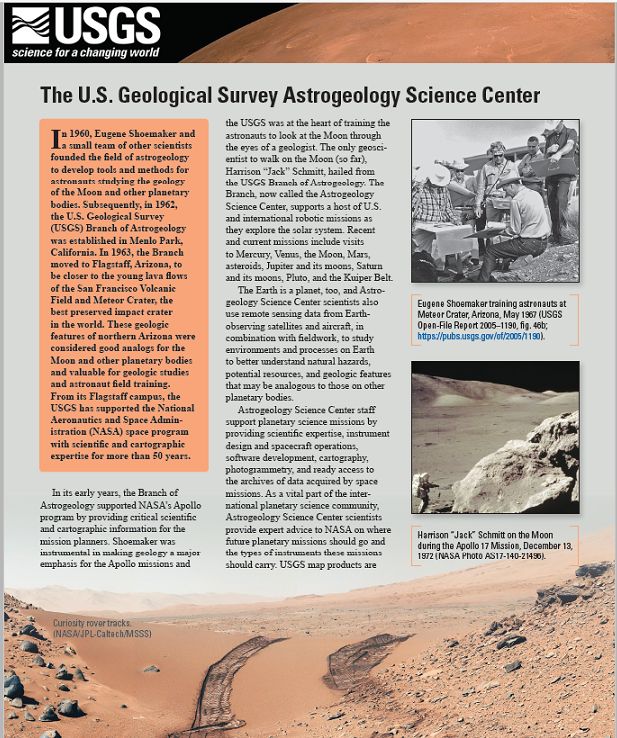 You can find out more information about Astrogeology in the fact sheet that we put together to celebrate our own 50th Anniversary a few years ago.